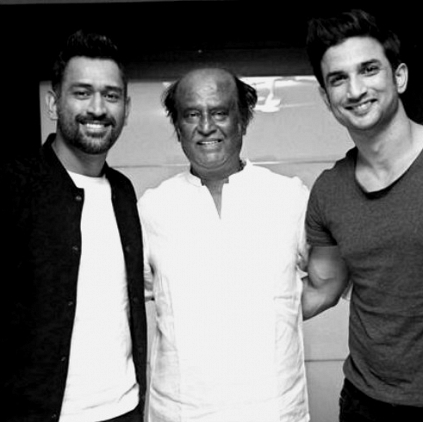 WHAT DID M.S.DHONI DISCUSS WITH SUPERSTAR RAJINIKANTH? What a pleasure it was to see Dhoni (along with the team of M.S.Dhoni : The Untold Story crew) meeting Superstar Rajinikanth. Dhoni also went live on Facebook from Thalaivar’s living room! For the uninitiated, here’s what the Indian skipper discussed with him yesterday (23rd September). Rajini could be heard enquiring Dhoni about how the movie conceptualized, and captain cool was seen explaining ardently. “30th? You mean coming 30th? 30th of September?” Exclaimed Rajinikanth, quite surprised that the movie’s release was quite near. “Your role? Who’s playing your role in the film?” He then asked, to which Dhoni pointed out Sushanth and introduced him. “He’s been learning to play like me too” He could be heard joking, and lit up all those present. Reportedly, Dhoni and co also enquired about 2.0s progress and they talked about it for some time. The crew was apparently left amazed after their evening with the Superstar, as Sushanth tweeted saying “How can someone be so genuinely humble and be the biggest superstar we’ve known. #ImmenseRespect @superstarrajini.” We couldn’t agree with you more. Producer to Mammootty; director to Mohanlal! Sivakarthikeyan's Remo on the rise! People looking for online information on MSDhoni, Superstar Rajinikanth will find this news story useful.